Many early Byzantine gems continued the Roman tradition of protective amulets. These protective amulets initially dedicated to pagan gods graduallly developed towards the Christian concept of an appeal, usually to Christ or the Virgin for assistance and protection. 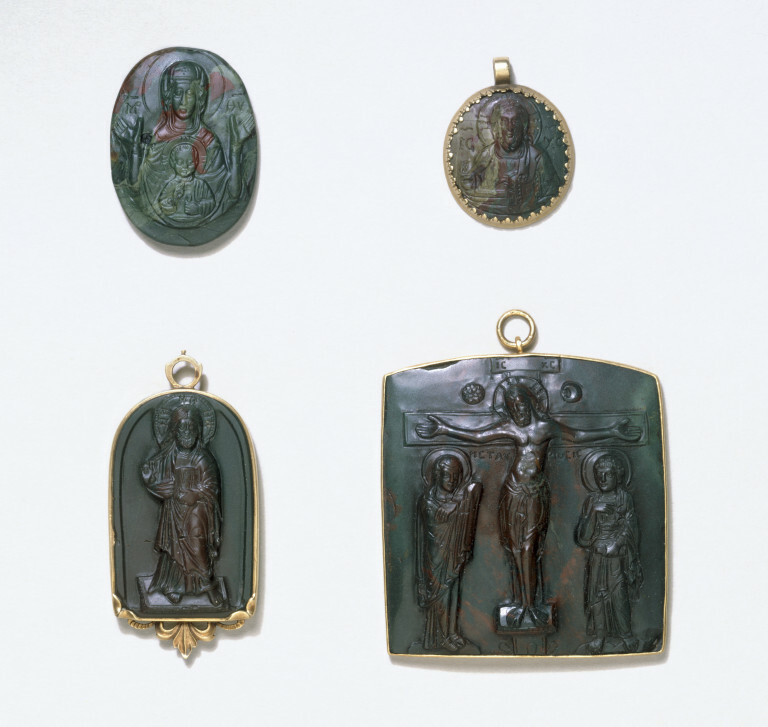 This cameo, depicting the Virgin raising her arms in prayer on behalf of the owner suggests a personal amulet, possibly worn as a pendant which would have hung on the chest and bourne an image of the protectress close to the heart . Cameo depicting the Virgin Mary her arms raised in prayer. Bought from Thomas Howard-Sneyd for £8,500 in 1982; previously sold at Sotheby's, 14 December 1978, lot 2. Cameos were produced throughout the course of Byzantine history and a significant number survive. They are carved from semi-precious stones such as jasper, sardonyx and as with the present example, bloodstone (Haematite). These gem stones are all so hard that they can only be worked with rotating instruments and abrasive grit. Semi-precious materials were used as they were generally considered to reinforce the power of the images and inscriptions which they carried. Michael Psellus (1018-after 1081) records this attitude. The use of bloodstone in the case of A.4-1982 may be significant. The natural red colour of the veins in the stone would provide a visual reference to Christ's self sacrifice and thus act as an integral part of the function and the message of the object. These objects are almost always displayed as jewels and may have been worn as pendants (Enkolpia) which hung on the chest and bore an image close to the heart, or as Williamson suggests, used to decorate book covers where they would help glorify the word of God. Early Byzantine gems continued the Roman tradition of apotropaism and were used as medical or protective amulets, a use which gradually developed towards the Christian concept of an appeal, usually to Christ or the Virgin for assistance and protection. The present cameo, depicting the Virgin raising her arms in prayer to intercede for the wearer or owner is entirely consistent with this use. 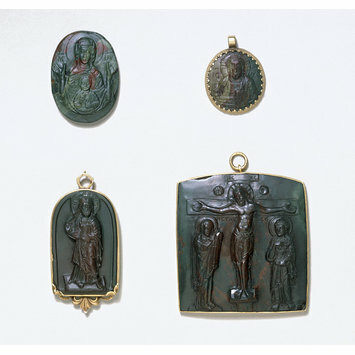 A cameo in the Metropolitan Museum of Art reveals the association with blood which this particular gem-stone had in Byzantine art. The Met cameo depicts on one side the miracle of Christ with the Woman with an Issue of Blood and the stone itself may have been considered effective in treatment of bleeding. If this is the case the presence of the Virgin and Child may indicate a role in the preservation of reproductive health. Cameos and related portable sculptures were instrumental in carrying Byzantine style to the West; in Venice, for example, Byzantine gems were copied in glass paste, as early as the twelfth century and many of the most popular Byzantine objects were transmitted on to objects and larger monuments made in Italy and elsewhere in the West. There were many different ways of showing Christ and the Virgin in the Byzantine East, but these different types usually adhered to conventions laid down in their original model: Thus the Virgin is most often shown as a Theotokos Hodegetria, Virgin Orans or the Virgin Blachernitissa so-called because the original image of this type was housed in the Blachernai monastery in Constantinople. The definition of the Blachernitissia type is a complex issue. The bust of the praying Virgin occurrs on coins issued by Constantine IX, Theodora and Michael VI between 1055 and 1057 on which the iconographic type is identified by an accompanying inscription. However, it is not clear whether these images derive from the main icon of the church, from one of the many other icons of the church, or even from the mosaic decoration of the church apse. An Orans Virgin with the bust of Christ Emmanuel in a medallion before her chest which occurs on an 11th century seal is labelled as a Blachernitissia although in other instances it is labelled an Episkepsis. The Virgin occupied a particularly special place in Byzantine religious life and art. Following the Council of Ephesus in 431 when she was confirmed in her title of Theotokos (literally - she who gave birth to God) her status in the Church was assured and the way was opened for development of her role in the liturgical, doctrinal and artistic life of Christians. This soon took effect in Constantinople where in the reign of Emperor Leo I (457-474) and his wife Verina the robe or veil of the Virgin was brought from to the city and deposited in a reliquary in a church that was dedicated to the Virgin, probably the church of Blachernai. Once home to the relics of the Virgin the city began to produce its own images of her. One such image was the fifth century icon of Blachernai which may have established the type from which the current cameo derives. The icon was paraded around the battlements during the siege of the city by the Avars and the Persians in 626 an event indicative of the Virgin's role as protectoress.